A defendant was on trial for murder. There was very strong evidence indicating guilt, but no corpse had been found. "Within one minute, the person presumed dead in this case will walk into this courtroom!" He looked toward the courtroom door. The jurors, somewhat stunned, all looked, eagerly. Finally, the lawyer said, "Actually, I made up the previous statement. But you all looked on with anticipation. I therefore put it to you that there is reasonable doubt in this case as to whether anyone was killed and insist that you return a verdict of not guilty." With that, the jury retired to deliberate. But after only a few minutes, they came back and pronounced a verdict of guilty. "But how?" the lawyer asked. "You must have had some doubt. I saw all of you stare at the door." 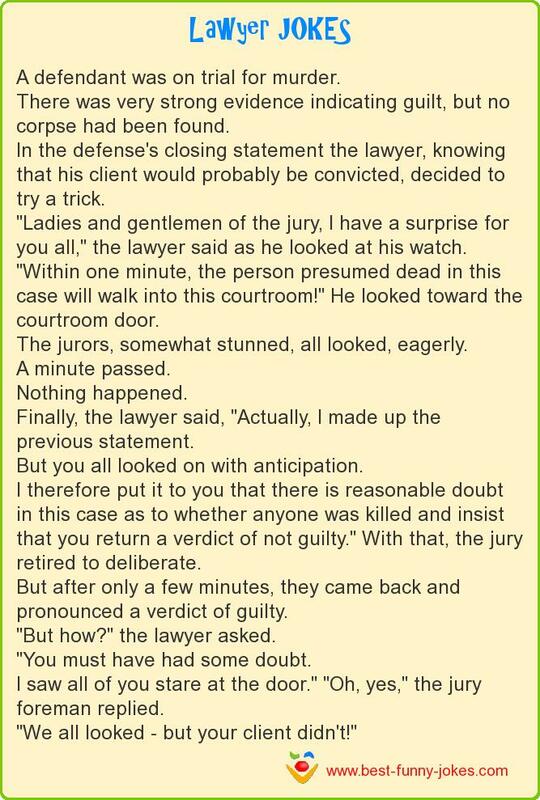 "Oh, yes," the jury foreman replied. "We all looked - but your client didn't!"